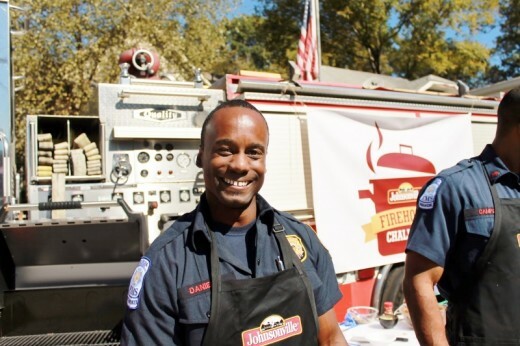 On October 20 my friend Carol and I went to Atlanta to take part in the Johnsonville Sausage Firehouse Cookoff. The event took place at Atlanta Fire Station 19 on North Highland Avenue. 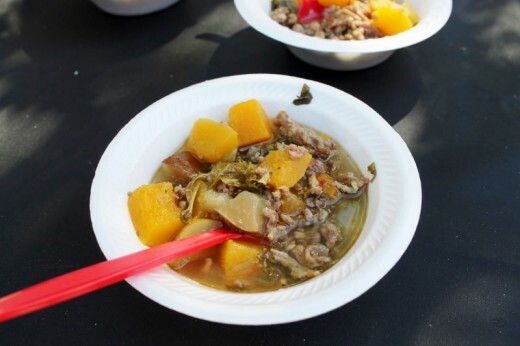 The Firemen from Station 19 were pitted against the Firemen from Station 30 to create and cook a one dish soup or stew in a friendly competition. The community was invited to come and taste the dishes that they prepared. 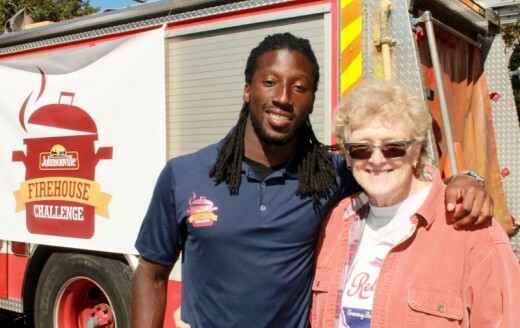 Atlanta Falcons Football Player Desmond Trufant was there, too. Everyone who came to the event got a vote on which one soup was the best. I have to tell you, it was really hard to chose one as the best. 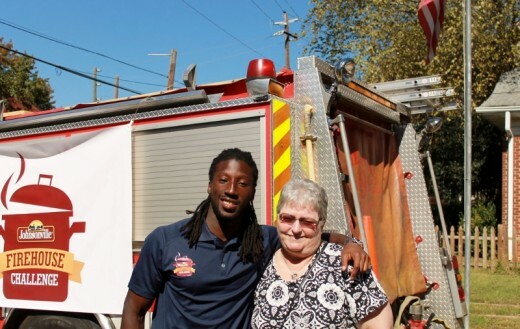 I spoke to Desmond Trufant and asked him a few questions. He said he has been with the Atlanta Falcons for three years. He is orginally from Tacoma, Washington. I asked him if he liked Atlanta, and he said he really does, but he didn’t expect to see snow here in the south. He was a very pleasant young man, and answered all of my questions with a smile on his face. 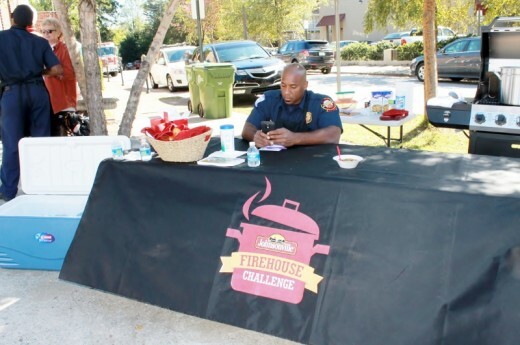 While the Johnsonville Firehouse Cookoff was a lot of fun, with good food and getting to meet the Firemen who protect the City of Atlanta, the purpose of it was to benefit the Atlanta Fire Department. 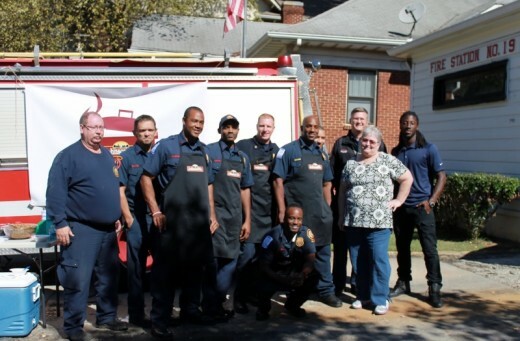 Johnsonville Sausage made a $5000 donation to the fire department for charitable causes. I also talked to Daniel, a Firefighter from Station 30. Their recipe was for Pumpkin Spice Sausage Stew. It was a thick, creamy soup with lots of textures. 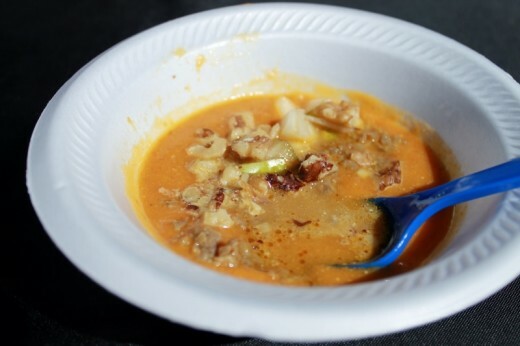 It had pureed pumpkin, chopped pears, chopped walnuts, and onion. The flavors mingled just right. Here is their recipe, which was created by one of the firemen from Station 30. Brown the sausage in a large stock pot over medium heat for 3 minutes. Add onion and continue to cook, stirring occasionally for 10-15 minutes. Add garlic and cook for an additional 5 minutes. Drain excess oil. Add pumpkin puree and chicken stock to pan. Season with salt, pepper, cinnamon, and bay leaves. Bring to a boil, then reduce heat and simmer for 30 minutes. Add coconut milk and simmer for an additional 5 minutes. Serve and garnish with pears and walnuts. Serves 6-8 Cook time: 30-35 minutes. Brown the Johnsonville Sweet Italian Sausage in a stock pot. Toss onions and squash with olive oil and red pepper flakes. When sausage is browned, drain off excess oil, and add onions and squash to pot, stirring occasionally for 5 minutes. Stir in sage leaves and apples. Add chicken stock and simmer for 15 minutes. Add kale and simmer for another 15-20 minutes until squash is tender. Add salt and pepper to taste. Serves 6-8 Cook time: 30-35 minutes. 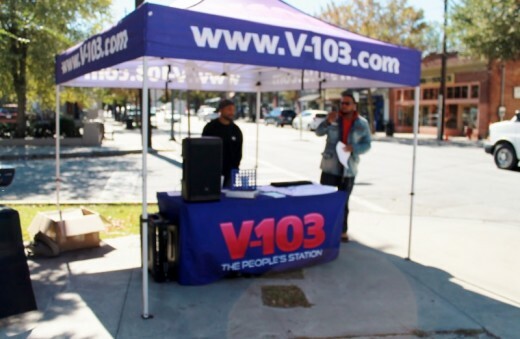 V 103 Radio Station was also there. Also on hand for the cook off was radio station V 103, who provided some hopping music for the festivities. I have to tell you that I enjoyed both of the stews equally. They each had a unique flavor combination, but they both made me think “Fall” when I tasted them. I will probably make both of them at home at one time or another. I am a huge fan of Johnsonville Sausage, so I cook with it almost every week. So which one did I vote for? Beause it had such a unique combination of ingredients, at for me, I voted for Station 30’s Pumpkin Spice Sausage Stew. Which one do you think you would vote for? Which one will you try first at home? What a fun event! Nice to know it benefited the Atlanta Fire Department. They do so much and deserve it!